Howard Cosell was one of the most controversial sports broadcast personalities in American media but his provocative style and refusal to conform redefined the role of the sports commentator and forever changed the relationship between professional sports leagues and broadcasters. An attorney, Howard William Cohen made a name for himself in the early 1950s as a radio and TV reporter of Cassius Clay/Muhammad Ali boxing matches. As the popularity of Clay/Ali fights rose, so too did Cosell’s prominence in the profession, but it was not boxing but football that made him a household name. 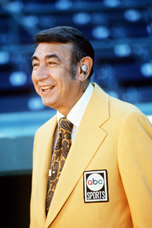 A member of ABC’s original Monday Night Football broadcasting team, Cosell worked alongside football legends Don Meredith and Frank Gifford from 1970 to ’83, offering a style of commentary never heard anywhere, much less on national television. Cosell’s signature “I tell it like it is” style clashed with many viewers, including some decision-makers within ABC, but the comments that fueled now-legendary on-air clashes with Meredith turned Monday Night Football into the nation’s top-rated program and established the show as a national phenomenon. to take the microphone and initiating the common era of 24-hour sports coverage. The non-athlete among the Monday Night bunch routinely scorned former athletes who he suspected had become sportscasters based solely on their playing fame, inventing the phrase “jockocracy” to hammer home his point. Cosell admittedly did not master the intricacies of the sports as well as his former-athlete partners did, but he was never fazed by critiques of his ignorance. An unapologetic interviewer who freely shared his opinions, including a famously strong defense of Ali’s refusal to be drafted into the army, Cosell had a knack for asking penetrating questions of athletes, treating them no differently in the interview chair than he would government officials. After leaving Monday Night Football because he felt that professional football had become “a stagnant bore,” the personality expert found his niche as a boxing commentator for ABC’s Wide World of Sports, where he could tell the stories behind the athletes, as well as comment on the matches themselves. Cosell continued to work in radio even after becoming a national television personality. His show, Speaking of Sports, was affiliated to radio stations nationwide and gave way to an expanded show, Speaking of Everything. On television, he provided commentary for ABC’s Monday Night Football and worked on ABC’s Olympic coverage, most notably reporting directly from the Olympic Village in Munich during the Black September murders in 1972. The commentator will forever be remembered as a man who was as good at creating an audience as he was at alienating it, and that, ultimately, was just what sports needed.